Star Trek Doom has been in development since at least 1997, when it was just a series of new Doom levels wearing a low-res, vaguely Star Trek skin, as an early video shows. Its latest upload, however, features new weapons such as dual-wielded phaser pistols and a portable proton torpedo launcher. There’s even a story now, which sees you play a young ‘Lieutenant DoomGuy’. In the year 2371 (towards the end of The Next Generation TV series) you’re testing some shuttle upgrades when the Enterprise is suddenly attacked by the Borg and Species 8472 – a pretty rough day. The rest of the plot is pretty Doom-like, as from there on out, it’s up to you to teleport onto the Enterprise and save the ship by killing everything on it (apart from the occasional surviving crew member). 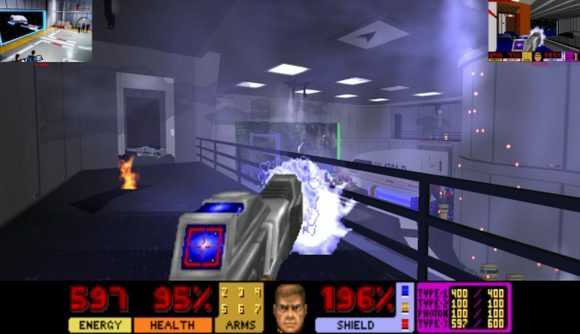 After taking a four-year break from the epic project, modder Blake resumed work in 2016 by popular demand, and remastered everything for GZDoom – a source modification of Doom that enables 3D acceleration and a variety of new graphical features. Star Trek Doom now looks thoroughly entertaining, as you can see in the demo video below. The opening scenes of the shuttle window onto space are more reminiscent of Duke Nukem 3D than Doom II. It’s a reminder of how rich the Star Trek universe can be, and how sad it is that there has still probably never been a truly great Star Trek game, despite many attempts (hat-tip to Elite Force). If you’re interested, take a look at Star Trek Doom on ModDB here, or at Blake’s ‘Sanctum’ here. ModDB has a couple of articles on the enemies, NPCs, and weaponry that Blake has developed. You can also read more about its more than 20 years of development, check out screenshots and videos, and download your choice of two playable demos depending on whether you prefer MIDI or MP3 music.